Vi h�ber alle vore g�ster har hygget sig og gl�der os til at se dem igen. Vi er �bner igen i April 2019 Dog er vi p� banen igen uge 42, hvis vejret tillader det. 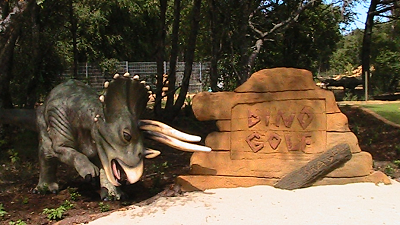 Plan your trip to Dino Golf Today! Or are you planing on an Event for the employees of your company, or just a cozy day/evening with your coworkers, then send us an e-mail or call us and we will try to arrange something for you. Welcome to a worldclass experience! Dino Golf, is not a place you come across very often. Not only is it europe's largest minigolf tracks, but also an experience for the whole family. It resides in the natural forrests that surround the city of Skagen and with the local flora as decorations and the massive and most of all impressive dinosaurs it makes walking through the entrence feel like a trip through time. Back to when the dinosaurs ruled the earth. This makes the minigolf not only a good and challanging way to spend your time with family and friends, but also a visual and sensual experience i the beauty of the Danish nature. Dino Golf is for the whole family and enhusiasts of all ages. At Dino Golf, there has been created some fantastic frames around the golf aswell. By using special artificial turf, called astroturf, it gives the best and most real experience.